"Alien" investors are financing Vermont ski area developments. Got a problem with that? When Anthony Korda invested $500,000 into a massive expansion of Jay Peak Resort, he didn’t do it for the fresh powder. He did it for the Florida sunshine. Korda, a 50-year-old lawyer from London, England, had wanted to live fulltime in the Sunshine State ever since visiting the U.S. for a family vacation years ago. He considered seeking out a law firm to sponsor him for a work visa but was deterred by what he knew would be a cumbersome, years-long process. Then Korda heard about an obscure immigration program called EB-5. In exchange for sinking $500,000 or $1 million into a government-approved economic development project that creates at least 10 jobs, foreign investors can quickly obtain a two-year green card and get on a fast track to permanent residency and, ultimately, to citizenship. “I thought it was too good to be true,” says Korda, a polite and well-spoken Englishman, during a phone interview. The EB-5 program has earned the nickname “million-dollar visa,” and it’s easy to see why. Anyone with a clean record and $1 million — or $500,000 in Vermont’s case —can, in essence, cut the line ahead of refugees and non wealthy immigrants slogging through the immigration bureaucracy. EB-5’s backers, including Sen. Patrick Leahy, have made no apologies for an immigration policy that gives deep-pocketed foreigners speedier service than the proverbial huddled masses. Rich immigrants are adding wealth to the country and creating jobs Americans need, the argument goes. It’s in everyone’s interest to make it easy for them to spend their money here. But some critics contend that anyone projecting real job gains based on EB-5 is counting their chickens before they hatch. Even the feds admit accountability has not been their number-one priority. Korda learned of Jay Peak’s EB-5 immigrant investor offer and visited the resort during the summer of 2006. He met with resort co-owner and president Bill Stenger, who showed him the new golf course and plans for expansion. Three days later, Korda left Vermont having committed half a million dollars to Stenger’s venture. Months later, with his temporary green card in hand, Korda moved his wife and two kids to Naples, Fla. Aside from an initial trip to Jay Peak the preceding year, he hasn’t set foot in Vermont. 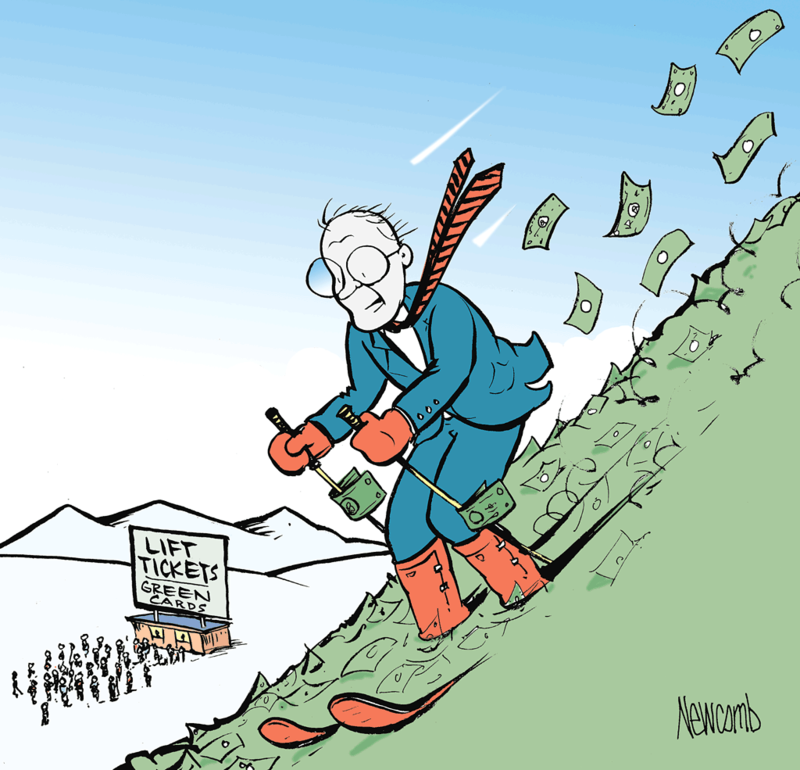 Korda is one of dozens of foreigners funneling tens of millions of dollars into expansion projects at Vermont ski resorts in economically hard-hit parts of the state. His money is helping finance an ambitious expansion at Jay Peak that includes an indoor water park, an ice-skating rink, a new hotel with 57 suites and room for 220 guests, and new shops, restaurants and pubs. When completed in 2012, the new Jay Peak will employ some 600 new workers year round and create twice as many “indirect jobs” in poor towns around the mountain, according to Stenger. The goal is to turn Jay Peak, which has a summit view into Canada, from a winter escape into an all-season playground for thrill seekers from both sides of the border. It looked like a safe investment to Korda, who’s personally more interested in white sand beaches than white ski slopes. The lawyer, who describes himself as successful but “by no means a multimillionaire,” sank his entire life savings into the $500,000 Jay Peak investment so he could live in America. His heart is in Florida. Vermont just offered a way to get there. Today, Korda is a practicing immigration attorney in Naples and helps other foreign investors process EB-5 applications. He is also, along with dozens of others, a limited partner in Jay Peak Resort. Now he and others like him are hoping it pays off. Modeled on Canada’s foreign investor visa, the EB-5 program was launched in 1991 under the first President Bush as a way to get money and jobs into the country. After stumbling through early scandals, the program hit its stride and is now channeling large fortunes into business expansion, earning hundreds of foreign nationals quick and easy green cards. The visa program gives foreigners like Korda, who might have trouble securing a work visa, a direct route to a green card that admits spouses and children under 21 along with them. Investors can live and work anywhere in the country, and their kids can attend college at U.S. resident costs. Vermont embraced the idea and, in 2004, created a state office under the Agency of Commerce and Community Development to connect foreign investors with local businesses seeking money to grow. Significantly, the entirety of Vermont, with the exception of Greater Burlington, was designated as a Targeted Unemployment Area, a measure that cuts by half — from $1 million to $500,000 — the amount an investor needs to spend to qualify for a green card. Sugarbush Resort is raising $20 million from 40 investors in Asia, the Middle East and Europe to pay for a new guest services lodge. The 40,000-square-foot building will house everything from children’s day care and lockers, to ski and equipment rentals, and will adjoin a “magic carpet” lift that whisks guests to new “learn-to-ski/ride” areas for kids and adults. The project is scheduled to break ground as soon as this spring. Enter EB-5. Stenger says he went to Wall Street to seek financing for Jay Peak’s expansion and struck out. Greshin says he did find domestic financing for the Sugarbush project, but not at prices he wanted to pay. The foreign financing deal was “what we judge to be a better cost,” Greshin says. For Vermont businesses looking for new sources of capital and state agencies running low on assistance money, the visa program has been a godsend. Jay Peak and Sugarbush were first out of the gate, but three other companies are on track to have their EB-5 applications approved. One is Seldon Technologies, a nanotechnology firm in Windsor that makes high-tech water purification systems. The other two companies haven’t gone public with their plans yet, so the state won’t name them. Gov. Jim Douglas has made himself a visible pitchman for the program. At the end of this month, he will lead a Vermont delegation on a whirlwind trip through Asia in search of investment dollars. From October 21 to November 1, Douglas, Stenger and others will barnstorm convention centers in Seoul, Shanghai, Hong Kong and Taipei, where they’ll sell Vermont and its businesses as the best investment an Asian entrepreneur can make. At stake will be millions of investment dollars, hundreds of Vermont jobs and dozens of green cards for foreigners who might otherwise find it almost impossible to get one. The EB-5 program targets some of most job-starved regions of the country, and the Jay Peak area is no exception. The Northeast Kingdom consistently reports the highest unemployment rates in the state — almost twice those found in more affluent communities such as Woodstock and Stowe. The need for high-paying jobs there and elsewhere in Vermont cannot be overstated. But does the EB-5 program create the jobs it promises? Stenger and the state officials running Vermont’s EB-5 program say yes. But the details are less clear, and built as much on economic models as on actual employees you can count. To get a green card in most places, a foreign investor must prove through pay stubs and W-2 tax forms that his money has created at least 10, 35-hour-a week jobs at the targeted business. Because most of Vermont’s a Targeted Unemployment Area, investors here only need to demonstrate with economic formulas that their money will indirectly create 10 jobs in surrounding towns. Stenger’s project at Jay Peak, for instance, is expected to create 600 year-round jobs, ranging from lower-wage waiters and chambermaids to highly paid executive chefs and IT managers. But Stenger is banking on generating about twice as many “indirect jobs.” The theory: New Jay Peak employees will spend their income on cars (so dealerships hire more salespeople), lunches (restaurants hire more cooks) and groceries (supermarkets hire more checkout clerks). Stenger says the models are government approved and that jobs are, in fact, being created. Hundreds of Vermonters have already been put to work constructing the wood-frame hotel rising at the base of the mountain, he says. Kruszka guesses that fully 75 percent of the jobs created by EB-5 in Vermont and elsewhere are indirect jobs based on formulas; only a quarter are “direct” jobs you can count. That’s not OK, says Doug Hoffer, a Burlington-based policy analyst who has followed the EB-5 program with interest. If the U.S. is trading green cards for greenbacks as a matter of national policy, he believes, the government should know exactly how many jobs of which kinds are being created, and should make that information available to the public. The current wait time for regular immigrants to get a green card is between one and five years. Immigrant investors can have a temporary green card in fewer than three months, a permanent one 18 months later and full U.S. citizenship within five years. Or, at the very least, a season pass.